Promoting the understanding and appreciation of Oceanic art. 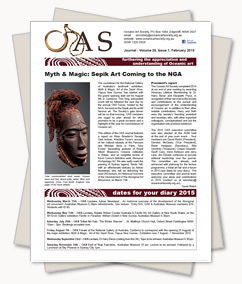 Read this issue of the Oceanic Art Society (OAS) Journal using the PDF viewer below, or download the PDF using the Download PDF button located at the bottom of the page. To access this page, you must purchase a membership, or log in if you are a member. Become a member today for access to the latest journal content and receive a printed yearly journal subscription!